In Moscow, there are many urban legends of government shelters and secret subway. RBTH presents a summary of trustworthy facts about military communications located deep under Russian capital. Underground shelters that can withstand a nuclear hit, automobile tunnels from the Kremlin to Stalin’s suburban dacha, underground airports and tank tunnels of Moscow - isn’t it all some kind of nonsense? Yes, but only to some extent. Underground bomb shelters and transport communications for the Soviet government did—and still do exist. After World War II, construction of underground shelters, meant to protect civilians from after-effects of nuclear bombing, started in Moscow. But the highest government and military officials needed special protection – during wartime, only they can make decisions and apply measures to save the country. Specially fortified shelters were built under strict secrecy in different parts of the city. To escape the city in case of bombing, the people in charge also needed means of secure transportation. Regular subway was unfit for that because of low level of protection, so “second subway” was constructed – it connects major government shelters and underground command centers, and also has a long radius leading outside the city borders, to vast suburban shelters. This system was labeled “Metro-2” by Muscovites. We’re not disclosing state secrets here, as all the evidence that proves the existence of these systems is quite public. First, there are caps of mining shafts and ventilation kiosks, located in different parts of the city. 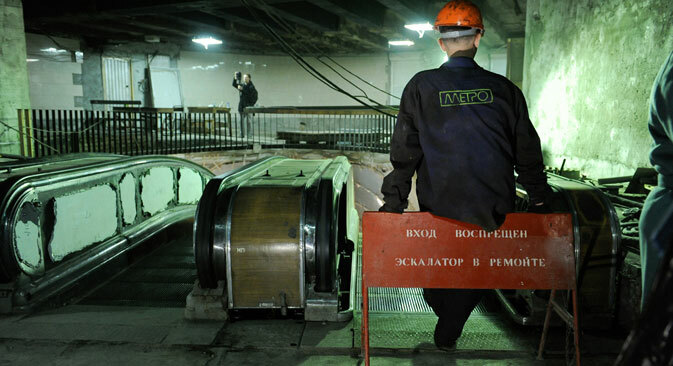 Moscow subway lines were constructed using the “deep bore” method, when a shaft about 20 feet in diameter and 200 feet to 230 feet deep is dug to reach the level where actual line construction starts. Later, the shaft is used both to transport mining machines down to the mining level, and to remove the earth. After the construction is completed, the shaft closes, and when it’s open, it means that works are under way. In the ‘70s, one such shafts was located near Red Square, inside the building of Gostinyi dvor, and could be seen on panoramic photos of Kremlin. Today, another shaft can be seen near Kitay-gorod subway station, although it’s clear that civil subway construction here had stopped decades ago. There are also a few active shafts in suburbs and outside city borders, where subways doesn’t exist. The shabby, almost abandoned looks of shafts and ventilation kiosks contribute to their secrecy; meanwhile, they are duly guarded and impossible to infiltrate. Evidence can also be seen inside the Moscow subway. There are blocked stairways and gates leading to “nowhere” in some of the stations, and the famous dead-end line, that can be seen to the left of the train going from Sportivnaya station to Universitet stations. The line, as amateur explorers report, ends near a massive gate, which is believed to be one of the entrances to Metro-2. An inside source told RBTH that each of the officers with access to Metro-2 is allowed only into one part of the system. None of them know how many clearance levels there are, so nobody sees the whole picture and possesses the whole plan, making the declassification of the whole installation virtually impossible. In Moscow, there are two Stalin bunkers, which you can easily get into with a guided tour. The first of them is located near Izmailovskaya hotel and is said to have been built in the ‘30s. In reality this place is a former storage area, which was decorated in the ‘90s to serve as a tourist attraction. The second bunker is located near Taganskaya subway station, and this one is real; however, it has no connection to Stalin at all since its construction was finished after Stalin’s death. This object was built as a shelter for the Headquarters of Long-Distance Air Forces. It is located 200 feet below and occupies an area of 75,000 square feet. In the ‘60s, the bunker was equipped with life-support systems, supplies of water and food enough to support the officers for a long time, but in the ‘80s its condition deteriorated, and in 1995 it was declassified. By that time, steel coating on the walls and hermetic doors were the only original objects left in the whole bunker. Nevertheless, the object is very interesting. Its main entrance shaft, that has an elevator leading down to the bunker grounds, is protected with a 20-feet thick concrete cap, hidden inside a fake 19th century house with blank windows. This cap protects the shaft from a nuclear explosion wave and can withstand a direct hit of an aerial bomb. Now, the bunker is owned by a private enterprise that organized The Museum of The Cold War, which offers guided tours, organizes parties, banquets and presentations – for instance, the world premiere of a popular video game “Red Alert 3’ was held in the bunker. Among the biggest tourist attractions is a staged air-raid alarm that sounds during every guided tour, and a fake nuclear missile attack on foreign countries that can be “launched” from inside the bunker by its guests. RBTH contacted Viktor B., a former guide of the bunker, who told us about the reaction of visitors to air-raid alarm staging. “Mostly it’s fear, especially among women and children. But it passes quickly when a guide tells the group that the alarm is fake,” he said. There were, though, some uneasy situations. According to Viktor, once, a very cheerful lady from Latin America passed out to the sound of the alarm. “The other time, a grown-up man wet his pants when he heard it,” he said. Still, “everybody reacts to the “missile launch” trick, especially Americans! They start bombing their homeland right away, ‘Let’s do New York! We don’t care much, we’re from Florida!’,” he said. Such jokes, of course, were unimaginable in the times of Cold War, and thank God these times are long gone, but the real strategic shelters still exist, and are rumored to still be in perfect working condition.